Zandvlei is a wetland reserve in the southern part of the Peninsula. Over the years all available land around this wetland has been utilised for housing and the wetlands have slowly dwindled. Unfortunately with the dwindling of the land so has the habitat of the Western Leopard toad. The toad is unique to this part of Cape Town and has become endangered due to the advance of civilisation into its habitat. During August the toads migrate to water to mate. In Kirstenhof the toads live in people's gardens for most of the year but in August during a five day period they make their way down to the water and streams that run through Kirstenhof. 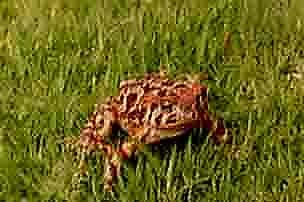 Residents of the area have become aware of the migration and have seen the slaughter that occurs when these already endangered toads migrate. Many of the toads have to cross the roads and highways that have been built in the area which once was their sole habitat. Kirstenhof residents have decided on a plan of action to assist the toads in their migration and move into the streets from about 6.30 pm in the evenings till approximately 1.00am in the morning. 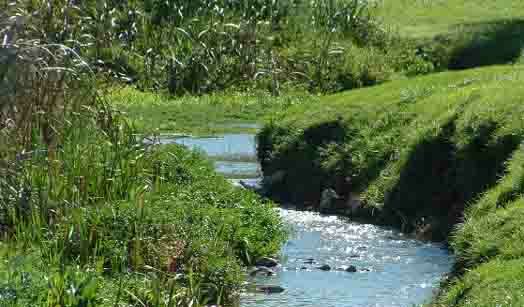 Any toad found in the street is captured and placed in a bucket or basket and ferried to the stream and wetland area which runs through a park in the middle of Kirstenhof. Road sign warning that toads are about. 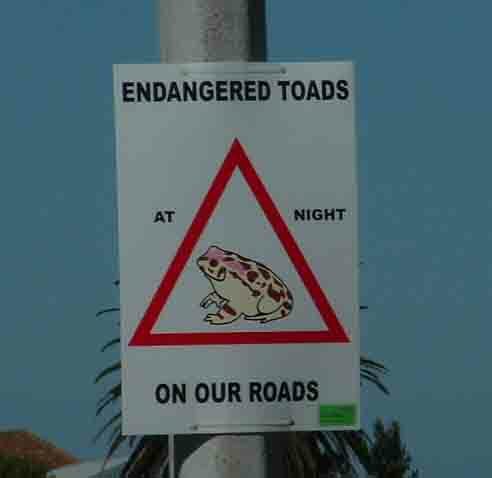 Motorists in the area are warned to watch out for the toads by signage placed on the street lamp poles in the area. The streets become a meeting place for a number of dedicated residents who spend their time catching the toads. Some people even come from as far as Hout Bay to assist in the rescue. An even larger threat to the toads is a proposed toll road that will run through the habitat of the toads. Not only will this road divide the toad's habitat further but will also result in thousands more toads being destroyed by cars as they migrate during the migration season. The unfortunate part about this roadway is that it was planned many years ago when the whole of the southern peninsula was uninhabited and there was plenty of wilderness to choose from to destroy with a road. Most of the then wilderness has been built up and the area kept aside for the proposed road is all that is left for the toads. Nature conservation and residents of the area have taken the plight of the toads to the authorities but to date they have not had any success in stalling plans for the proposed road. Cape Town is a most interesting travel destination. Its time you visited it to see it for yourself.